The Apple iPod Racer will be competing in the Charleston Pack 28 Pinewood Derby. We are hoping for a win in the "best creativity" class to highlight the spirit of Creative West Virginians. Apple has nothing on us. Wish us luck! Today I am attending the World Health Care Congress2nd Annual Leadership Summit on Consumer Connectivity in Carlsbad, CA. Good presentations and discussion with those in attendance. You can follow the conference via Twitter at #WHCC2 or get live blogging at EKIVE by Mark Schrimshire using Cover It Live. I just finished up my afternoon presentation with Rod Piechowski with the American Hospital Association on the topic of Overcoming Legal and Policy Barriers for Health IT Adoption. With the recent passage of ARRA 2009 we thought it valuable to talk about the changing landscape of Health IT as a result of the new bill. Below are the slides from my presentation. Medical Economics covers the developing world of physician social networking websites in Behind doctors' social networking websites. Interestingly the article begins with a story about a West Virginia physician, Danine Rydland, MD, using Sermo to search for information to help her treat one of her patients. Fellow health care lawyer colleague, AHLA HIT member and friend, Jud DeLoss, provides an excellent overview of the Physician Incentives under the HITECH ACT. The incentives focus on providing direct payment for the adoption, implementation and maintenance of electronic health records (EHRs) to "eligible professional" who establishes the "meaninful use" of an EHR. Check out this post and others at Jud's Minnesota Health IT Blog. I noticed some traffic coming from the Avvo Blog and realized that they compiled a list of top legal blogs based on Alexa traffic rankings. Currently my Health Care Law Blog comes in at #98 on the list. If you are new to legal blogs this is a great list to see the variety of law related blogs available. Thanks to Avvo for compiling and sharing the list. This week's settlement by CVS, the nations largest retail pharmacy chain, to pay the U.S. government a $2.25 million settlement and take corrective action highlights the need for providers and other covered entities to focus on the simple privacy protections such as appropriately disposing of patient information in a secure manner. The first known joint investigation and settlement by the U.S. Department of Health and Human Services (HHS) and the Federal Trade Commission (FTC) with CVS was the result of CVS failing to guard patients PHI when disposing of patient information such as identifying information on pill bottle labels. . The investigation started after various news media reported fiding prescription drug and other PHI had been dumped into unsecured trash containers at CVS pharmacies. As a result CVS not only violated the HIPAA Privacy Rule but also was brought under the FTC's deceptive business practice guidelines by claiming that CVS represents to consumers that maintaining customer privacy was central to their operations. Yesterday the Charleston Gazette ran an op-ed piece, West Virginia A Leader In Health Information, written by Kenneth Kizer and Peter Groen. As Congress deliberates the economic stimulus package aimed at, among other things, accelerating use and adoption of health information technology, leaders would be well served to look to West Virginia's example as a guide for how to accomplish this objective in a cost-effective fashion. The state Department of Health and Human Resources has just completed rolling out Bar Code Medication Administration in all eight state hospitals. This technology, developed by the VA in the late 1990s, has been shown to reduce the overwhelming majority of medication errors among hospitalized patients. DHHR completed implementation of OpenVista, the commercial version of the internationally known electronic health records used by the VA last fall. This means that all federal and state hospitals in West Virginia now use essentially the same system. No other state has done this. West Virginia University Hospitals recently launched the second phase of implementing a proprietary electronic health records system. A recent survey conducted by the Shepherd University Research Corp. found that 76 percent of state hospitals have at least begun implementing an electronic health records system; this is among the highest rates, if not the highest, in the nation. These are important developments that will result in higher quality and safer health care, reduced costs and saved lives. The people of West Virginia should take pride in these accomplishments - and look forward to completion of additional efforts underway. Gov. Manchin's strategic plan for improving health care in West Virginia envisions important improvements, including installing electronic medical records in all hospitals and clinics in the state; implementing the West Virginia Health Information Network - a statewide network to improve information flow between different types of healthcare facilities; implementing a new web-based Medicaid claims management system to more efficiently process claims and better detect fraud and abuse; expanding use of personal health records; and continuing to increase e-prescribing. Under the leadership of DHHR Secretary Martha Walker and Medicaid Commissioner Marsha Morris, the department has launched a Medicaid transformation initiative aimed at creating "medical homes" for Medicaid patients. Medical homes use "health information exchange" technology to connect different types of electronic medical records so that they are integrated to provide more complete information so that doctors can better treat chronic diseases like diabetes and heart disease and more effectively work to keep people healthy. The Medicaid program has established the West Virginia Health Improvement Institute and an Innovation Community to teach caregivers how to integrate health information technology and medical home concepts to support patient education and self-management. Pilot programs to show the effectiveness of these efforts are underway. The West Virginia Medicaid program competed for funding from the federal Centers for Medicare & Medicaid Services to support these efforts. Further, the West Virginia Telehealth Alliance is one of 69 programs across the country that has been funded to enhance broadband capacity for nearly 300 participating facilities supporting telehealth and HIT applications in West Virginia. Clearly, West Virginia has taken the initiative and is aggressively moving forward to improve health care using a blend of open source and commercial health-care IT systems. There is much the rest of the nation can learn from West Virginia's experience. Kizer, a doctor and public health specialist, is a former undersecretary in the U.S. Department of Health Services. Groen is with the Computer & Information Science Department at the Shepherd University Research Corp.
Next week I will be speaking at the World Health Care Congress 2nd Annual Leadership Summit on Consumer Connectivity in Carlsbad, CA on February 23-24. I will be co-presenting a session on Overcoming Legal and Policy Barriers for Health IT Adoption with Rod Piechowski, Senior Associate Director for Policy, American Hospital Association and Director, National Assocation of Health Information Technology. Friend and West Virginia lawyer colleague, Pat Kelly, told me today about the release of his new book on client development and rainmaking. Although I have yet to read the book -- I know Pat well and look forward to his valuable insight on the topic. 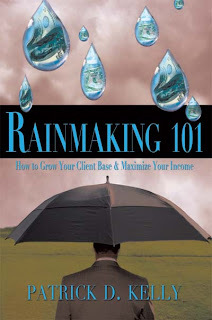 Rainmaking 101: How to Grow Your Client Base & Maximize Your Income, is being distributed through Authorhouse, Amazon and Target. The price at Authorhouse is $14.95. Each year, millions of talented men and women embark on professional careers, convinced that technical proficiency and hard work alone will propel them to the top, only to find themselves competing with an army of equally ambitious newcomers. Which individuals will beat the odds? THE RAINMAKERS. Young entrepreneurial professionals who excel at the most important skill of all — client development. Mere months after graduation from law school, Pat Kelly realized that his legal education had failed to cover one very important component to being successful — how to attract and maintain clients. Mr. Kelly discovered that it wasn’t enough to be smart, diligent, and motivated. He had to gain a competitive edge and make business RAIN DOWN on himself and the fi rm that hired him. On the pages of this easy-to-read book, he spells out the essential skills, attitudes, and strategies that can help you do the same. Stand out from a crowd of talented professionals. Bridge communication gaps that separate you from older generations. Make the most of social and professional events. Follow the “Platinum Rule” to build client trust and loyalty. Develop quality relationships with colleagues and clients. Hone vital social and conversational skills. Deliver presentations with lasting impact. DECIDE NOW to be a RAINMAKER. With a little practice, a little imagination, and a little creativity, the only thing that won’t be “little” will be the results.